Hall contracting can build hardscapes including retaining walls and other permanent fixtures for your yard. We provide these hardscape services for both residential and commercial properties. Large slopes or rough terrain demand the need for attractive landscapes. We can build you what you need using boulders, veneer stone, blocks, and can walk you through the various options. Pavers are a wonderful way to enhance the style, elegance, and beauty of an outdoor area. Pavers are durable, well-constructed, and long lasting, making them the perfect choice for outdoor ground surfaces. With high-quality paver design and paver installation, our team can deliver decorative and versatile paver surfaces for any residential or commercial application using all sorts of materials. 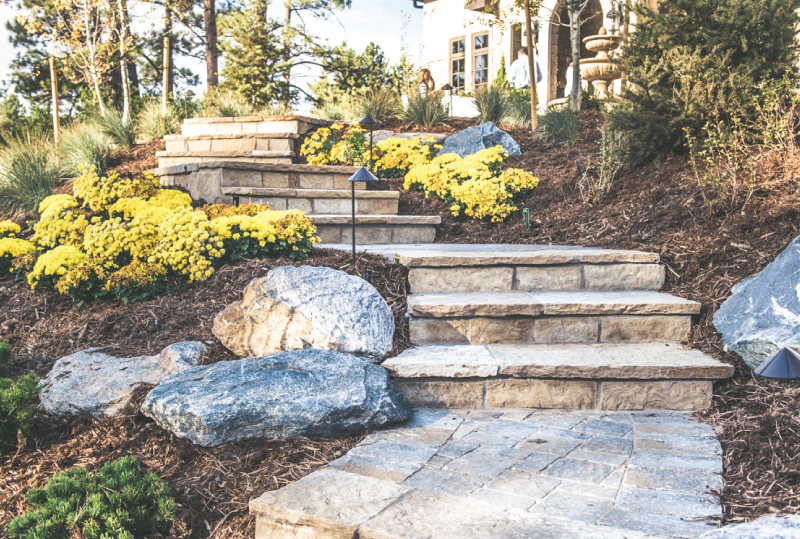 In our Colorado landscapes retaining walls can not only be used to increase the aesthetic value of your landscape but can also be used to protect your home from water damage or other elements. If you are looking for a paver designer in Denver, Arvada, Aurora, Boulder, Brighton, Castle Rock, or other cities near to Denver look no further than the professionals at Hall Contracting. As a leading Denver pavers contractor, our team will use style enhancing landscape pavers to transform your outdoor area into a beautiful and stylish space. Thinking of a Hardscape? Get a quote today. We offer a ZERO OBLIGATION FREE QUOTE for hardscapes. We can discuss plans, design, location, budgets, and ensure we find the best solution for you to transform your space into something beautiful. Click below and set up a FREE QUOTE today.